Drove out of Devon county and into Somerset. Stopped at Glastonbury (England's version of Nimbin!). Legend has it that the Holy Grail is buried at Glastonbury Tor. 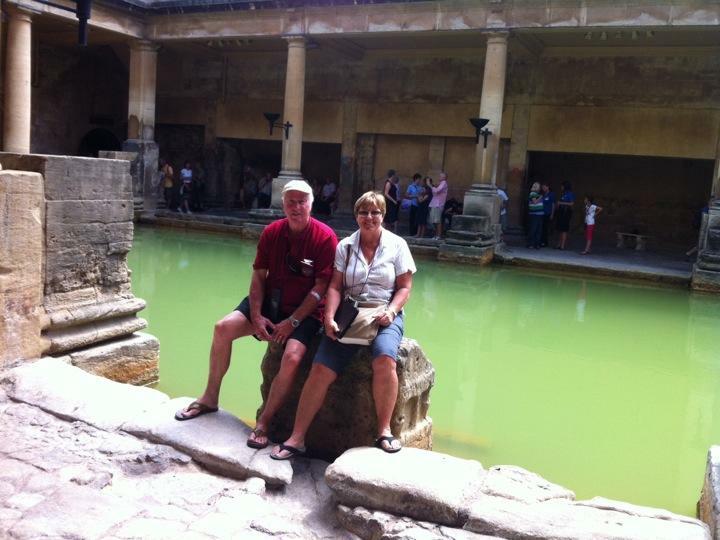 We spent a few hours at Bath and went through the Roman Baths. Water was green and slimy, but very pretty town with the River Avon passing through. The Crescent and the Circus (most prestigious addresses in Bath) very impressive and easy to picture life here in Georgian times when everyone came to Bath for 'the season' and to 'take the waters'. We continued on to Cardiff on the M4, crossing the Bristol Channel on the second Severn crossing bridge (3 miles long) which is the border between England and Wales. Went to The Queen's Vault for dinner. Had a beautiful rump steak and a Brains Light (the local brew).